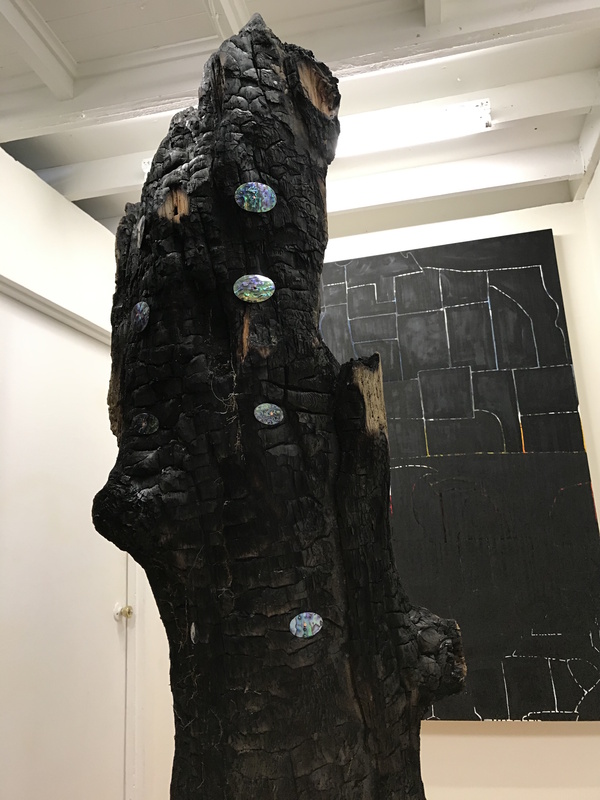 PRESS RELEASE: SAN FRANCISCO, CALIFORNIA--RIGHT WINDOW Exhibition and Gallery space presents Black Flag in the Desert of a Future Ocean, a site-specific installation and public exhibition organized by Kevin Killian featuring artworks by artist Erik Bakke. Black Flag in the Desert of a Future Ocean is selections from recent series of Bakke's works engaging in conversation with elements created specifically for the Right Window exhibition and gallery space. Maps rendered from memory are the foundation of large-scale paintings in black oil from the series 1958; colorful, quasi-geometric abstractions, mathematical relationships as metaphor, and overt and hidden textual messages inform the paintings , sculptures Third Dimension Yellow Ratio (pi over three), and installation Fourth Dimension Magenta Ratio (pi squared over sixteen); linking the past to the future is a burned totem with abalone shell eyes; and flying above the exhibition is the painting Black Flag Ratio 1.9. The exhibition is designed to encourage the viewer to engage in considerations of aesthetics and in prognostications on the short- and long-term fate of humanity. Erik Bakke (erikbakke.com) is an artist, writer, educator, and curator living and working in the San Francisco Bay Area. Bakke has participated in group shows and solo exhibitions globally and serves as Managing Editor for Aftershock Magazine (aftershockmagazine.com). He is currently an art and writing instructor and director of the Writing Center and the Intensive English Program at Menlo College, Atherton, CA. Black Flag in the Desert of a Future Ocean is organized by acclaimed American poet, writer, and playwright, Kevin Killian. The exhibition is on view 24/7 during the month of February at the Right Window art gallery and exhibition space. 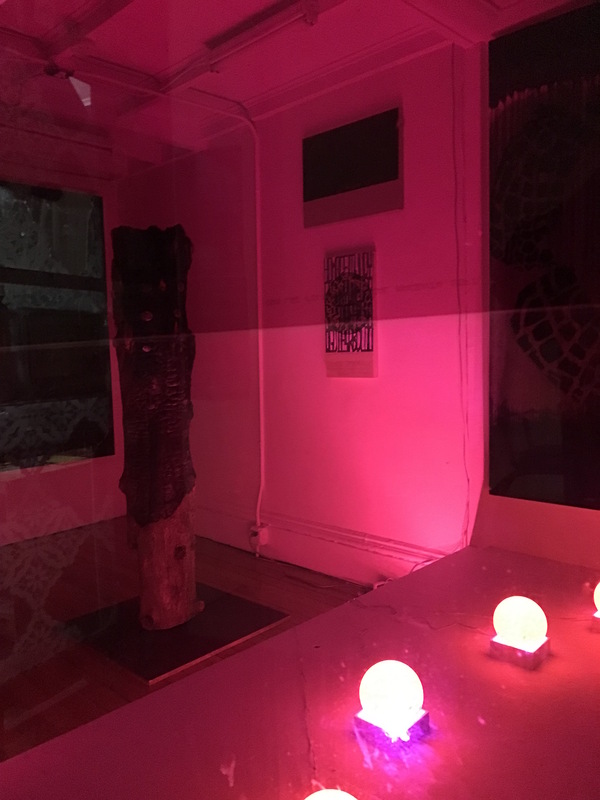 Right Window was founded in 2007 and serves as a public gallery/window exhibition space in the Artist Television Access (ATA) building at 992 Valencia Street in The Mission District of San Francisco, California. 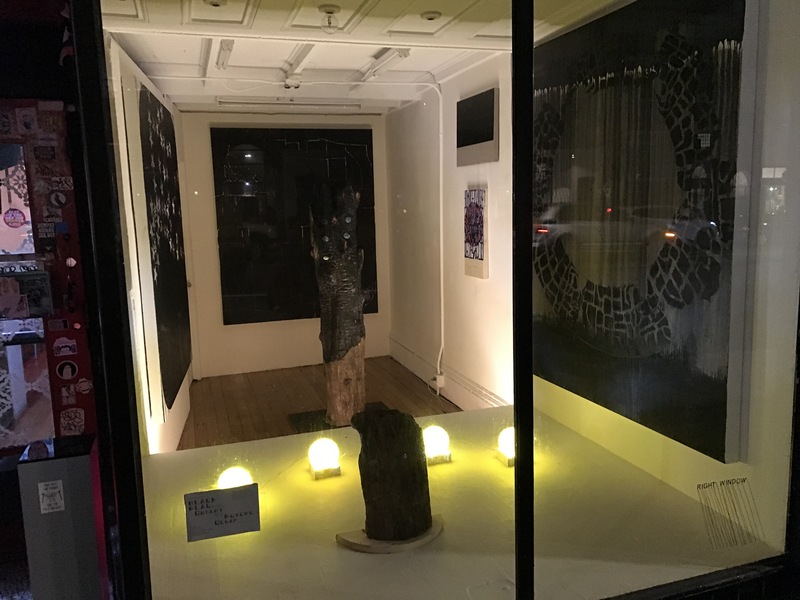 Right Window hosts monthly window exhibitions and is collectively run by Ajit Chauhan, Takming Chuang, Norma Cole, Craig Goodman, Brett Goodroad, Tanya Hollis, Colter Jacobsen, Kevin Killian, Cintia Santana, Steven Seidenberg, and Carolyn White. Special thanks to Kevin Killian for his generosity. Karl Bakke and Linda Bakke for their help. Text for presentation by Erik Bakke at reception of Black Flag in the Desert of a Future Ocean.